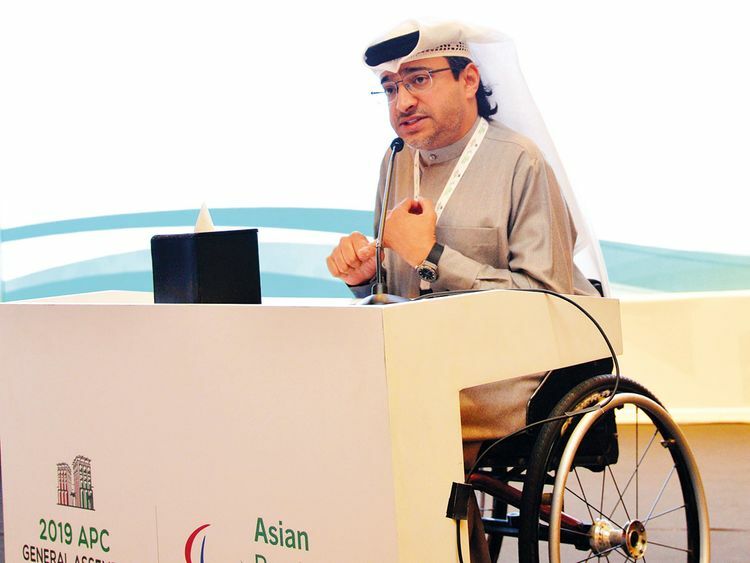 Dubai: The UAE’s Majid Abdullah Al Usaimi was elected unopposed as President for a second term at the Asian Paralympic Committee (APC) General Assembly that concluded in Dubai on Wednesday. With Al Usaimi getting a majority 35 of the 39 votes cast, Masayuki Mizuno of Japan also retained his position as Vice-President with 25 votes, and was joined by Jang Hyang-sook from Korea, who polled 28 votes from the total 70 cast. Saudi Arabia’s Abdul Raheem Al Shaikh (22 votes) and Malaysia’s Keng Chuan Ng (22 votes) were elected as the two Members at Large after three rounds of voting. “We need peace, tolerance and a lot of hard work as we continue pursuing our strategic plan to develop the Paralympic movement in Asia,” Al Usaimi told Gulf News. “Now, more than ever, is the time to connect with everyone. The strategic plan of development will always be our guide, and should be show signs of lapse, we will always go back to basics,” he added. Jeong Min-lee of Korea, who was elected Chairperson of the APC Athletes’ Committee at last year’s Asian Para Games in Indonesia, will also sit on the new Board, alongside the five sub-regional representatives who were also elected during the Jakarta Games. Zhao Sujing of China, representing the 2022 Hangzhou Asian Para Games, will occupy the final position on the Board. In accordance with the APC Constitution, Tarek Souei, the APC CEO is also on the Executive Board but with no voting rights. The new executive board will serve under Al Usaimi’s presidentship for a three-year term, till 2022. Established in 2002, the Dubai-based APC is the driving force of the Paralympic movement of Asia and works at supporting athletes with an impairment to achieve sporting excellence, and at increasing awareness and participation in Paralympic sports on the continent. President: Majid Rashid Abdullah Al Usaimi (NPC UAE); Vice-Presidents (2): Ms. Jang Hyang Sook (NPC Korea); Masayuki Mizuno (NPC Japan) 25 votes; Zhao Sujing (NPC China — as representative of the 2022 Hangzhou Asian Para Games). Chairperson of Women in Sports Committee (1): Nasanbat Oyunbat (NPC Mongolia). Member at Large (2): Abdul Raheem Al Shaikh (NPC Saudi Arabia) 22 votes; Keng Chuan Ng (NPC Malaysia) 22 votes.